The Bug is Beige but certainly not boring. Neutral boost sound complements amp. Practical tonal options. 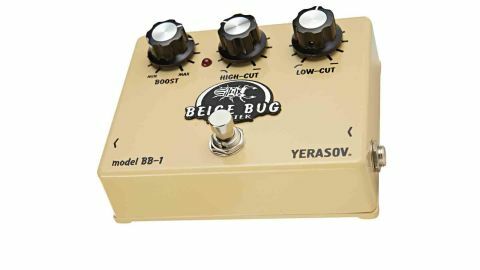 The Beige Bug from Russian firm Yerasov can provide a massive 30dB of boost, plus tonal shift, if you want it, delivered in a way we haven't seen on other boost pedals. "With the boost on offer you can push a valve amp to various degrees with a fairly neutral sound"
We get high cut and low cut knobs that, turned fully clockwise, offer a flat response. Rolling the knobs back starts to bring in the cut, so you can reduce either the top end, the bottom or a combination of both. With the boost on offer you can push a valve amp to various degrees with a fairly neutral sound that's like adding a more overdriven second channel. The cut knobs come in useful if you want to tame the top end of your boosted sound, (something we found ourselves reaching for on louder boosts), or lose a little body for more of a treble boost vibe. Various combinations are available until, with both knobs at full cut, you get a frequency-restricted tone that gives prominence to the upper mids. A decent utilitarian booster with practical tonal options.